When was the last time you allowed yourself to stop and take delight in a beautiful sunset at the end of the day? The cabin known as Sunset Getaway is nestled in a pretty wooded area just four miles northwest of Nashville, and its front porch swing is a perfect spot for watching the sun go down. The well-mannered dog who understands the meaning of “house-trained” will be welcome here, too, if Rover likes to accompany you on the occasional countryside romp. The log cabin is cozily outfitted to ensure you have a relaxing stay, with comfy furniture in the great room where you may want to cuddle up with a big bowl of popcorn for some TV time. The kitchen has the necessities for cooking up a simple snack or a feast, and all the dishes can go in to the dishwasher when the party is over. The main level also offers two bedrooms: the master bedroom… ready for you to get a good night’s sleep in the big king-size bed that’s dressed in a pretty patchwork quilt; and the second bedroom with a queen-size bed is close by. No need to let boredom take hold while you’re a guest at Sunset Getaway…trot downstairs and call your best shots as you gather round the pool table; watch a favorite movie on TV; and set up your favorite drinks at the wet bar. You can pull out the bed in the sleeper sofa for an extra guest or two. A second bathroom on the lower level is handy for guests having fun or sleeping there. We think you’ll appreciate the accommodations outside, too… there’s a hot tub, firepit and an outdoor grill to round out the fun. A picnic table on the deck will be an inviting place to chat as you pass around a platter of your favorite foods from the barbecue. You may want to challenge your friends to a quick game of cards here, or just discuss where you’re going to go next as you pursue the vacation way of life in Brown County. 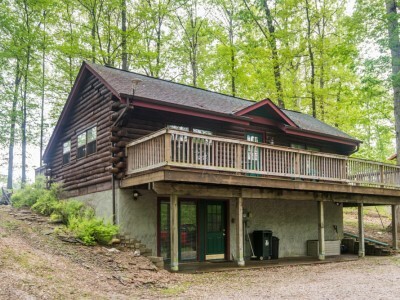 When you’re ready to venture out from the cabin, you can choose from many activities in our area, such as hiking through Yellowwood State Forest, mountain biking in Brown County State Park, riding horses, going after your opponents in paintball games, or swooshing through the treetops on a zipline. If you prefer more laid-back pursuits, then you should investigate the variety of shops and galleries in the village of Nashville and beyond. Reserve Sunset Getaway today so you and your BFFs can make some awesome memories!